More than 15 Cubic meters of litter and debris was removed from the area of 35 acres of Shuvalan coast of Khazar district, in the framework of 27th Annual Coastal Cleaning Day. The event was held on 22nd of September initiated by The Coca-Cola Company. About 150 volunteers participated in the event. “We are happy that this campaign, happening for the 3rd year round in Azerbaijan, is so successful! Every year the number of people, who want to participate in the International Coastal Cleanup Day grows. We express our deep gratitude to those people and organizations, supporting us through years and show their civil position, that everyone should follow for the sake of safe environment.”, - stated Coca-Cola Operations Manager in Azerbaijan Gabil Axmedov. “We consider the cooperation with big business companies, bringing their contribution to the protection of the environment as a huge positive experience and a good example to other organizations and businesses," - the head of the Green Baku club Aydin Huseynov said. The coast of the Shuvalan village was cleaned of plastic and glass bottles, cans and other litter and debris. The campaign was held under the "Pick it Up. Clean it Up. Sea Change!” slogan. 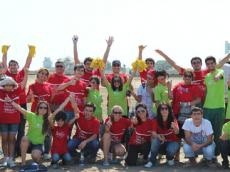 It was organized by the Coca-Cola Company, with the support of the «Green Baku» Club, Azerbaijan Diplomatic Academy, National Olympic Committee, JSC "Temiz Sheher", and AMEC Company. The ICC is The Coca-Cola Company’s premier litter abatement partnership and the world's largest single-day volunteer effort to eradicate litter and debris from beaches, inland waterways and oceans.